The rod seal is designed to ensure that pressurized fluid does not leak out of the system as the rod cycles back and forth (dynamic pressure sealing). 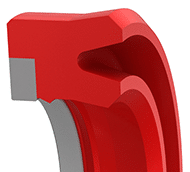 The rod seal is the most critical seal on any type of fluid power equipment. A leaking rod seal not only reduces equipment performance, but also causes environmental issues. 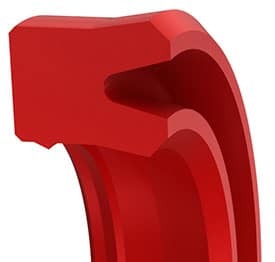 American High Performance Seals manufactures a comprehensive range of rod seal designs including lip seals, PTFE cap seals, compact squeeze seals and application–specific designed seals made from high-performance elastomers and engineering plastic materials to offer maximum durability and sealing performance. 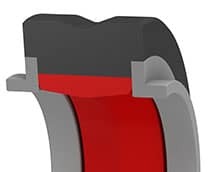 The extrusion gap is defined as the maximum radial clearance on one side between the seal housing opposite of pressure and the sealing surface. 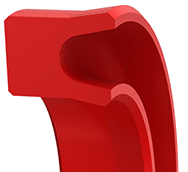 The extrusion gap is the most pressure-limiting factor to any seal. Larger extrusion gaps will always reduce a seal’s pressure capability. 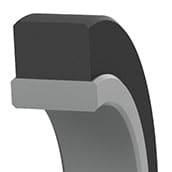 The use of wear rings always leads to larger extrusion gaps compared to a close-tolerance sliding bearing design without wear rings. 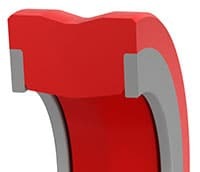 The above-metal exposed portion of the wear ring and tolerances are the dominating factors for the need for larger clearances between the two sealing surfaces. Typically, a harder seal material will increase the extrusion resistance and pressure rating of a seal compared to a softer seal material. 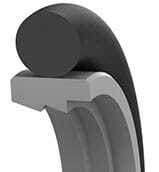 The typical hardness range for dynamic elastomeric hydraulic seals is 85-95 Shore A (similar to car tires). AHPSeals offers a variety of high-performance sealing materials in different hardness to meet the most challenging high-pressure sealing applications. 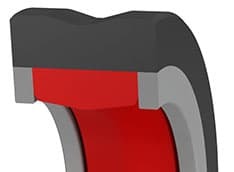 The proper design of a seal with a back-up ring will increase the pressure rating of a seal as long as the back-up ring is made of material with a higher modulus than the seal (typically noted as a harder material). AHPSeals offers specific rod and piston seals with integrated back-up rings to increase pressure capability. 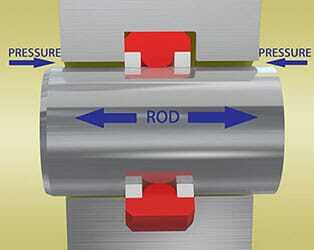 Higher operating temperatures will soften the seal and back-up ring material reducing its pressure capability. This affects most traditional seal materials when operating above 70% of their specified maximum operating temperature. Some of our high-performance sealing materials are designed to operate at 90% of their specified temperature without significant loss in hardness. Conversely, lower operating temperatures can increase the extrusion resistance of seal materials. – Non-symmetrical Rod Seals are seals where the shape of the inside diameter lip differs from the outside diameter (see Fig. 1, inside lip shorter than outside lip). 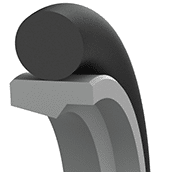 – Non-symmetrical rod seals provided by AHPSeals are not centered in the gland groove (Fig. 2) and provide sealing contact with the gland across the entire surface of the static outside seal diameter (Fig. 2a) for improved static and low pressure sealing. – Non-symmetrical rod seals are more stable and provide better sealing performance than symmetrical seals like U-cups or polypak type seals do. 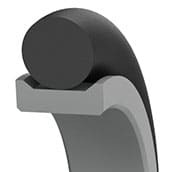 Our rod seals are non-symmetrical lip or squeeze type rod seal designs in which the diameter of the seal is oversized (Fig.2), and are available for both uni-directional and bi-directional applications. This seal design creates a hoop pressure and ensures a high static sealing contact force over the entire surface of the outside diameter of the seal (Fig.2a), providing significantly higher stability of the seal during operating cycles and eliminating rocking and pumping effects, thereby improving sealing performance. Instability of a seal can create leakage and seal damage. 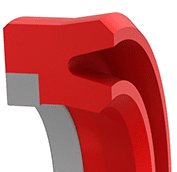 The basic design of a rod seal significantly affects the overall function of the seal, especially at low pressures. 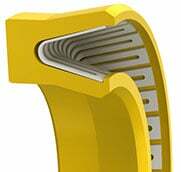 One of the most challenging applications is linear dynamic sealing at low pressure while providing low breakaway and running friction. 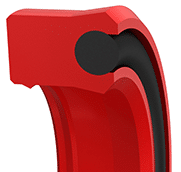 AHPSeals provides a series of low-friction rod seals for these challenging applications. – Lip seals are without any energizing rubber elements. 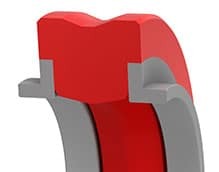 Therefore, they provide a more flexible dynamic seal lip and are generally characterized by lower friction on the unpressurized return stroke, resulting in reduced wear, longer seal life and moderate low-pressure sealing capabilities. 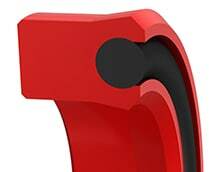 – Squeeze seals typically incorporate an energizing rubber element and are generally characterized by good low-pressure sealing, high friction, higher wear and therefore reduced seal life. – Beveled seal lip or chamfered seal lip is the most aggressive seal lip design. 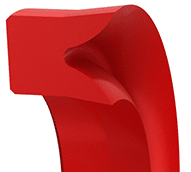 Most of our rod seals feature this lip design as it provides the best fluid film breaking ability, which provides the best sealing performance. 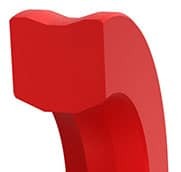 Sealing lips for all AHPSeals’ rod seals are precision machined for a sharp sealing edge that cannot be achieved by a net-molding process (Fig. 3). – Knife-edge and straight seal lip designs offer good scraping properties but reduced sealing performance and are used for sealing applications with high fluid contamination (Fig. 4 and 5). 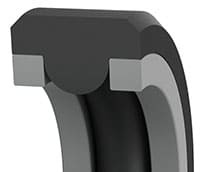 – Rounded seal lip is the least aggressive sealing lip and is typically used in pneumatic applications to maintain a microscopically thin oil or grease film on the bore to keep the piston wear ring and seal lubricated (Fig. 6). Particular attention should be paid to selecting the best rod seal for your application. It is important to properly pair the rod seal and the wiper for the best sealing performance. If a less aggressive rod seal is paired with an aggressive wiper, the wiper can scrape off the microscopically thin film of oil that remains on the rod in microscopic surface imperfections during the return stroke, resulting in system leakage. The thickness of the oil film depends upon the surface finish, rod seal and surface speed of the rod. For more information go to High-Performance Sealing Systems for linear, dynamic sealing applications. Application-specific and proprietary seal designs are available. Please contact engineering to get the best seal for your rod sealing applications. Pressure: up to 5,000psi (350bar)*. For pressure above 3,800psi (260bar), please contact engineering for clearances. Pressure ratings can be increased by reducing clearances. Materials: high-performance polyurethanes, NBR (Nitrile), FKM, Viton®, HNBR, EPDM, Silicone, low- and -high temperature materials, PTFE, PTFE, FDA-compliant seal material grades and proprietary specialized Duralast™, Duraloy™, and Permachem™ compounds. 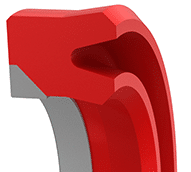 Most standard or non-standard and application-specific designed piston seals, in inch or metric sizes, are available with a 2-4 day turnaround. Designed to provide positive sealing in medium-to high-pressure service applications where low-pressure startup may be present. The non-symmetrical design provides better stability and static OD sealing, which is not provided by a symmetrical seal or polypak type seal. Will retrofit any polypak type seals or seals of similar design. Non-symmetrical design to provide the longest service life in medium-to high-pressure hydraulic rod sealing applications. Beveled lip for maximum fluid sealing ability. Economical hydraulic rod seal. Uni-directional O-ring energized low friction and long service life rod or buffer seal designed to protect primary rod seals from pressure spikes with minimal impact on system friction. The small axial seal height reduces gland height, weight and cost. Retro fits seals of similar design. Uni-directional rectangular energizer ensures positive seal, designed to protect primary rod seals from pressure spikes with minimal impact on system friction. The small axial seal height reduces gland height, weight and cost. Non-symmetrical seal design provides long service life in applications with worn rods and old equipment. Good contamination exclusion but reduced sealing performance due to a knife-edge seal lip design. Mainly used in old presses. Replacement seal not recommended for new designs. Capable of sealing low to high pressures from both sides with a small footprint. Compact and most economical double-acting rod seal for most bi-directional sealing applications. O-ring-energized seal providing smooth movement, low friction and long service life over a wide range of light- to medium-duty applications. The small axial seal height reduces gland height, weight and cost. Commonly used in hydraulic presses, machine tools, injection molding machines and mobile hydraulics. Square energizer ensures continuous contact along the sealing surface for low friction and improved low-pressure sealing in both directions over a wide range of service applications. The small axial seal height reduces gland height, weight and cost. Designed with integrated rod wear rings acting also as back-up rings to eliminate seal extrusion in high pressure systems where positive sealing from both directions is required. Compact and robust design for the most arduous conditions. Designed with an energizing element for easier fitment and responsiveness to changing pressures. 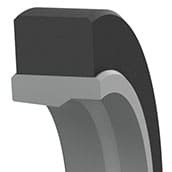 Integrated rod wear rings acting also as back-up rings to eliminate seal extrusion in high pressure systems where positive sealing from both directions is required. Compact and robust design for the most arduous conditions. 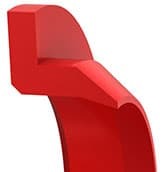 Contact us to request more information or call 1-800-283-7140 for immediate answers to your question. Heavy duty, linear and reciprocating dynamic sealing applications. Capable of handling high pressure spikes, larger running clearances and extrusion gaps. Pressure: up to 10,000psi (700bar)*, special designs up to 28,500psi (2,000bar)*. For pressures exceeding 5,000psi (350bar), please contact engineering for clearances. Pressure ratings can be increased by reducing clearances. 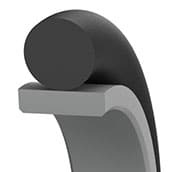 Materials: high-performance polyurethanes, PTFE, PTFE, engineered thermoplastics, NBR, Nitrile, FKM, Viton®, H-NBR, EPDM, FDA-compliant food grade, low- and high-temperature grades, including proprietary Duralast™, Duraloy™, and Permachem™ compounds. 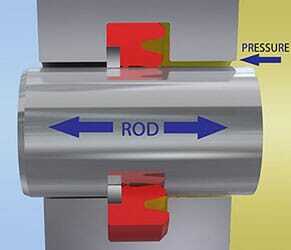 Eliminates seal extrusion in high-pressure systems with shock load. Design offers improved sealing performance and stability due to its secondary lip that also retains lubrication between both dynamic seal lips, providing long service life. Non-symmetrical design with integrated positive actuated live trapezoidal back-up ring to eliminate seal extrusion in high-pressure systems, with ultra-high pressure spikes and where low-pressure startup may be present. Non-symmetrical seal designed to eliminate seal extrusion in high-pressure systems with high pressure spikes. 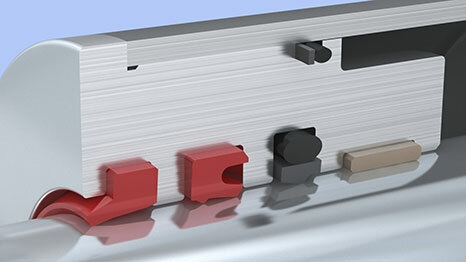 The integrated positive actuated live rectangular back-up ring eliminates extrusion, yet allows this seal to be fitted when fitment and assembly are more difficult. Reduced friction and wear provide a long service life. Designed to eliminate seal extrusion in high-pressure systems with shock load and increased clearance gaps where improved low-pressure sealing is required. 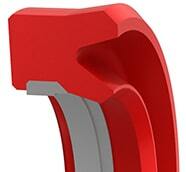 Easier fitment for smaller diameter seals. R50 provides excellent sealing performance, longer service life and stability due to additional sealing lips. Used for mining equipment and other demanding hydraulic sealing applications. 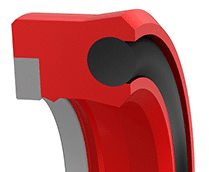 High–pressure compact rod seal design. The design utilizes two positively actuated live anti-extrusion back-up rings to support very high pressure from both sides. Available in Viton®, Nitrile, H-Nbr, Aflas® and other materials. 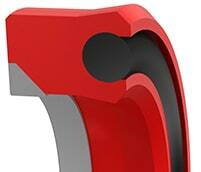 Designed to retrofit standard O-ring grooves designed for no back-up, single or two back-up rings. Retro fits seals of similar design. Designed with integrated positive actuated live back-up rings to eliminate seal extrusion in high–pressure systems with shock load or where increased clearance gaps are present. This is an excellent seal where positive sealing from both directions is required. Robust design for the most arduous conditions. Designed with an energizing element for easier fitment and responsiveness to changing pressures. integrated positive actuated live back-up rings to eliminate seal extrusion in high–pressure systems with shock load or where increased clearance gaps are present. This is an excellent seal where positive sealing from both directions is required. Robust design for the most arduous conditions. 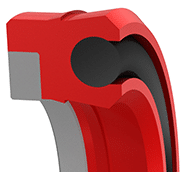 Tandem seal design allows the seal to provide a superior sealing performance over its entire pressure range. The additional activated secondary seal pumps back lubricant that passed the primary seal lip, reducing friction and minimizing seepage. The additional lip also minimizes seal damage in contaminated environments. Non-symmetrical design to provide longest service life in light-duty, low-friction hydraulic and pneumatic applications. The thin, flexible lip design quickly responds to low pressure and provides smooth movement with less breakaway force. Also a very economical rod seal. Materials: high-performance polyurethanes, NBR (Nitrile), FKM, Viton®, HNBR, EPDM, Silicone, low- and high-temperature, FDA-compliant seal material grades and proprietary specialized Duralast™, Duraloy™, and Permachem™ materials. 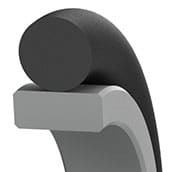 Materials: PTFE, PTFE, high-performance polyurethanes, NBR (Nitrile), FKM, Viton®, HNBR, EPDM, Silicone, low- and high-temperature, FDA-compliant seal material grades and proprietary specialized Duralast™, Duraloy™, and Permachem™ materials. Uni-directional low-friction O-ring-energized rod seal. This seal includes a secondary lip that gives the seal stability over a long stroke, acts as an excluder and retains fluid film. Can be used as a stand-alone seal. Designed for very low friction, extreme temperature service (cryogenic to high temperature) or chemically aggressive environments. The standard material for the V-spring is 301 stainless steel, other materials available. Providing low friction and long life over a wide range of light- to medium-duty service applications where higher pressure spikes can occur. The contoured PTFE cap is designed to resist extrusion and twisting of the O-ring under higher pressure. 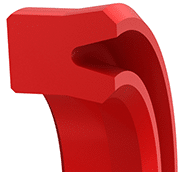 The S68A can be provided to retrofit into standard or modified O-ring grooves designed for no back-up, single or two back-up rings. O-ring-energized economical bi-directional light- to medium-duty hydraulic or pneumatic seal. The thinner PTFE cap is designed to better respond to low-pressure sealing. American High Performance Seals assumes no obligation or liability for any advice furnished, or results obtained with respect to these products. All such advice is given and accepted at the buyer’s risk.